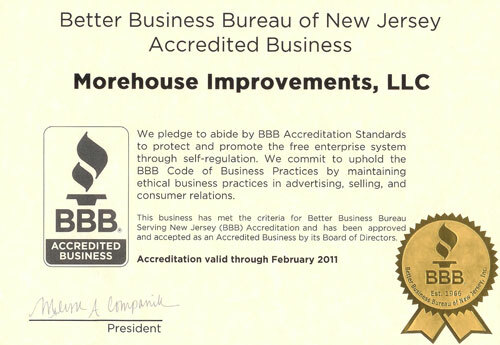 Morehouse Improvements LLC has spent the last seven years building our reputation as a reputable and reliable general contractor for Northern New Jersey’s home improvement needs. Our name is on the work that we do, so we will not cut corners. Thanks to the positive feedback, word-of-mouth referrals and testimonials from our past and current customers, we continue to build our pool of satisfied clients. All achieved by our hard work and dedication, from beginning the project to a successful completion. When we meet for our initial estimate or proposal, we listen to your needs and wishes, your must-haves, your budget, and all other factors and considerations that could arise during your home improvement project. We have no doubt you will feel comfortable with our expert knowledge, honesty and confidence in our capabilities and work ethic. We hope you like to stay “in-the-know” because you will be in strong and frequent communication with the owner, David Morehouse, throughout the entire project. David’s belief in personalized service shows in every project completed by his team. David is fully “hands on” for the duration of the project, which reinforces his promise to customers of personalized service. On April 22, 2008, EPA issued a rule requiring the use of lead-safe work practices aimed at preventing lead poisoning in children. On October 1, 2010, the rule becomes effective and firms performing renovation, repair and painting projects that disturb lead-based paint in homes, child care facilities, and schools built before 1978 must be certified, individual renovators must be trained by an EPA-accredited training provider, and the firms and renovators must follow specific work practices to prevent lead contamination.